This Short Sleeve Tee starts out soft, and gets softer and more comfortable with each washing. Comfortable longer length will give you a bit more coverage. Versatile great staple for everyday wear. Runs SMALL, so please check the chart for the actual garment measurement. Sizes are a modest S, M, L, XL. Sized on the small side, so if you may want to order UP a size or even two sizes. Check our Sizing Chart for ACTUAL pre-wash measurements. Because they are 100% cotton, you can expect a small amount of shrinkage, so please allow for this in choosing your size. 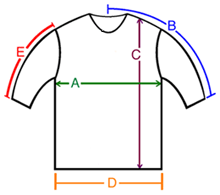 A: Chest / Bust circumference " " 30" 32" 34"
B: Sleeve length from center of neck to end of sleeve " 12" 12" 14"
C: Body length from shoulder to bottom of hem " 26" 26" 27"
D: Hem circumference " 34" 36" 40"
E: Sleeve length from shoulder to end of sleeve " 4.5" 5" 5.5"